Sara had more than eight years working at the Women’s Integral Development Association (AFDI) when she was selected as a GOJoven Fellow in 2011. She began her work at AFDI as a member, then with a position as treasurer, and is now the president and legal representative of the organization. 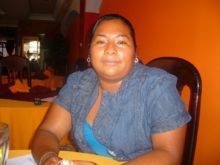 Sara also works as a trainer for the National Women’s Forum, where she facilitates workshops with groups of women and youth from various communities, and high schools in Huehuetenango. Presently, she is working to carry out a project for survivors of domestic violence in collaboration with the National Organization for Prevention of Domestic Violence (CONAPREVI) and the Women’s Advisory Department of Development (CODEDEH) in Huehuetenango. Her goal is to support women’s and youth groups in ways to prevent and eradicate sexual violence. Sara has her high school degree in computer studies and her goal is to gain an undergraduate degree in social work. Sara Beatriz was selected as a GOJoven Fellow when she was 28 years old. Posted in featuredfellow, Guatemala 2011.